Hi friends! Summer is just around the corner! 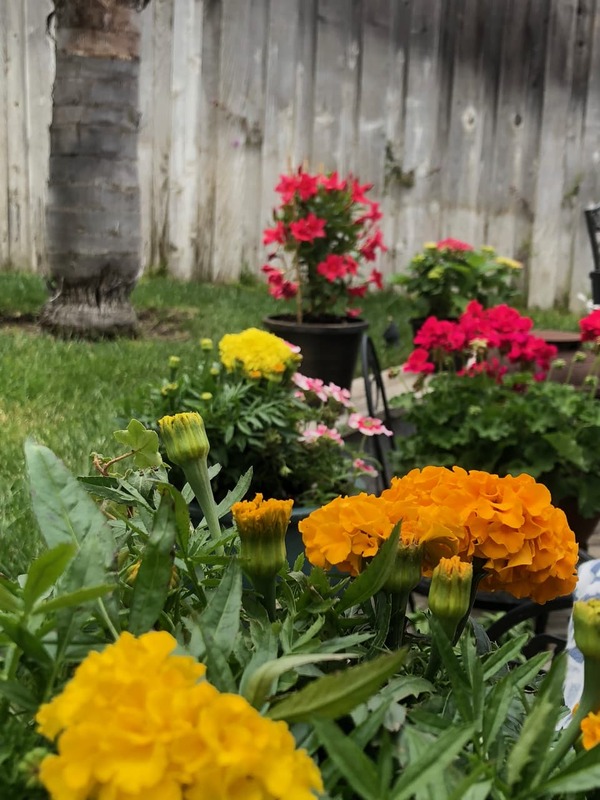 My youngest is graduating eighth grade this month and I knew I had to get it in high gear to clean the house and spruce up our patio a bit for our first warm weather gathering. Our Summer Patio Dressed In Hot Pinks and Summer Blues was a simple way to make our patio festive for summer gatherings. 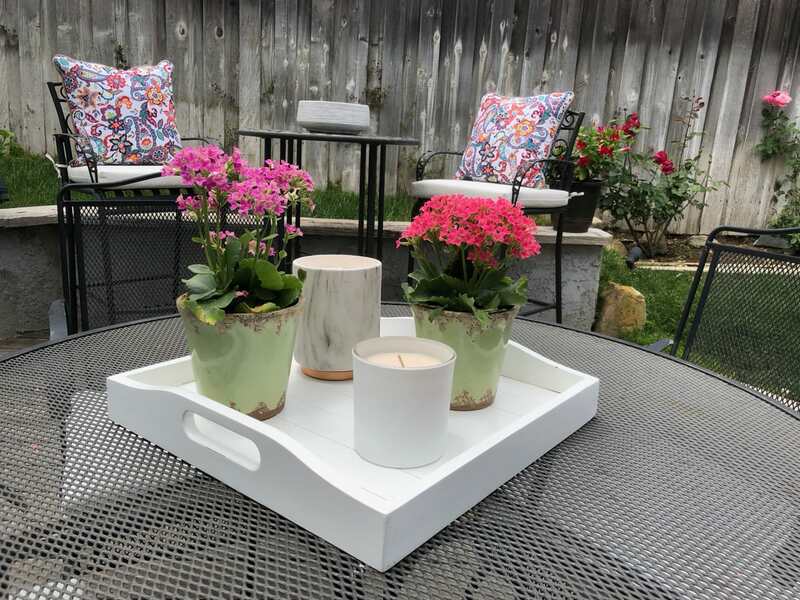 I will share our patio ideas and our summer garden patio container planters along with a fun Smore Maker! When I chose flowers this year I had every intention of coming back with red geraniums and white roses. I still had last year’s red chair pillows and was hesitant to leave my traditional color scheme. Browsing three local flower haunts I kept crushing over the flashy hot pinks peeking from every corner. Like a firefly on an old light bulb, I just could not keep away. My last stop was Lowes Home Improvement Center and I went a little hog wild. Not only did I NOW buy the basic whites and reds I pretty much grabbed any hot pink flower I could find. I tossed in a couple of yellow marigolds and white geraniums to add some variety but it mostly hot pinks! I was in love. 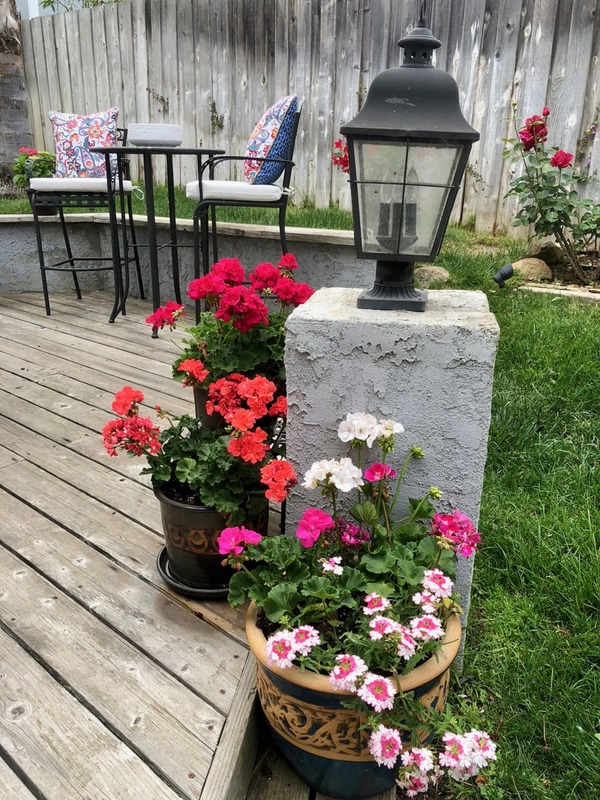 To save money on patio planters I chose a few flowers that came in pretty resin pots. I try keeping to a deeper natural color scheme so the planters would compliment each other. 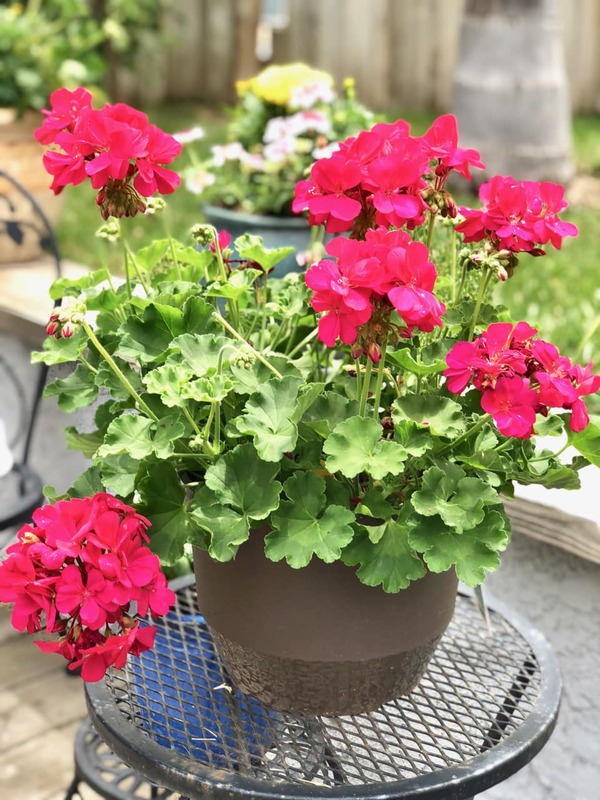 Patio containers can get pretty expensive, especially when you are buying flowers to fill them! For just a couple of more dollars, the flowers in the pre-potted containers were totally worth the expense. Our patio is in a sunny spot for several hours per day. I took this into consideration when buying the container plants. Here is my go-to guideline for choosing container plants. Find the zone on the tag and make sure it is in our zone. Is it full sun, part sun, or shade. We don’t have many shady spots so shady plants will not work. Does it require a ton of water? Calfornia is a water conscious state. Find out is it hardy? I don’t like using chemicals on the lawn. If I can make it question number six, then chances are that flower will end up in my basket! Our Summer Patio Dressed In Hots Pinks and Blues and Made In the USA furniture. We have loved this outdoor furniture set! A purchase after around the same time we upgraded the lawn. Hampton Bay patio furniture makes wonderful pieces that include rockers and love seats as well! We purchased our set at Home Depot. The high top bar stools and table were purchased at Lowe’s. ( I really love Lowe’s) We needed extra seating for a bridal shower and they just ended up a permanent fixture. It is nice to have extra seating along with the small garden set. 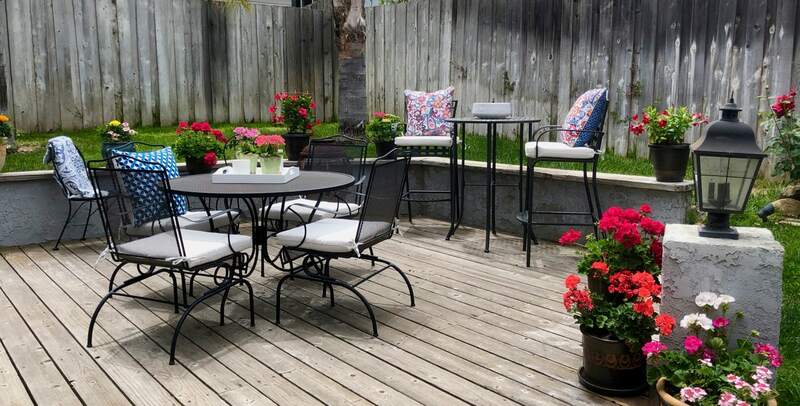 The patio is a great size, with two sitting areas and the dining table we comfortable sit eight and have room for another six with an added table from storage. The black metal furniture allows our color scheme to change without too much fuss. This made the switch from reds and white to hot pink so simple! Our backyard is still a work in progress! The top level of the yard was just dirt and brush and a giant old lemon tree on its last leg of life. We now have three citrus trees and two Queen palms . They sound so festive when there is a breeze, a little reminder of past beach vacations in the tropics! 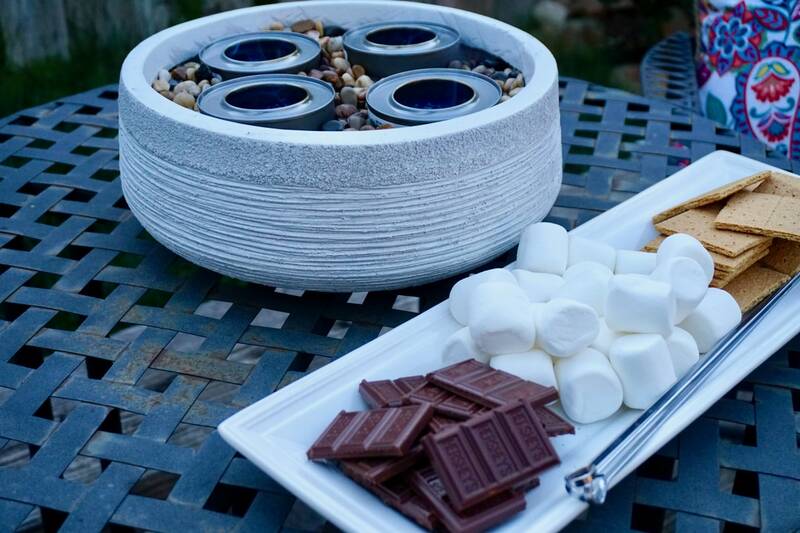 Another favorite addition to the patio this summer is this fantastic ceramic planter turned S’more maker! We have enjoyed tasty Smores twice and it works great! The hightop barstool table set works great to keep the hot flames away from little hands. I was surprised how well the chafing dish fuel gel worked to toast the marshmallows! Find the DIY Tabletop Fire Pit – S’more Maker post here. What draws the eye to the hot pinks? The simple white chair cushions and the jazzy pillows I found on a Homegoods Hunt (my favorite past time). The cushions are from Target, the Mom Store. White is a tough color for a busy family but we love the fresh crisp contrast. When we stain the deck it will even be more amazing! I hope our simple outdoor patio space ideas are helpful! I chose to not get wild and crazy and made it totally doable for all busy moms! Grab some gardening gloves and plant a few pots. Add a few herbs for making a fresh salad. 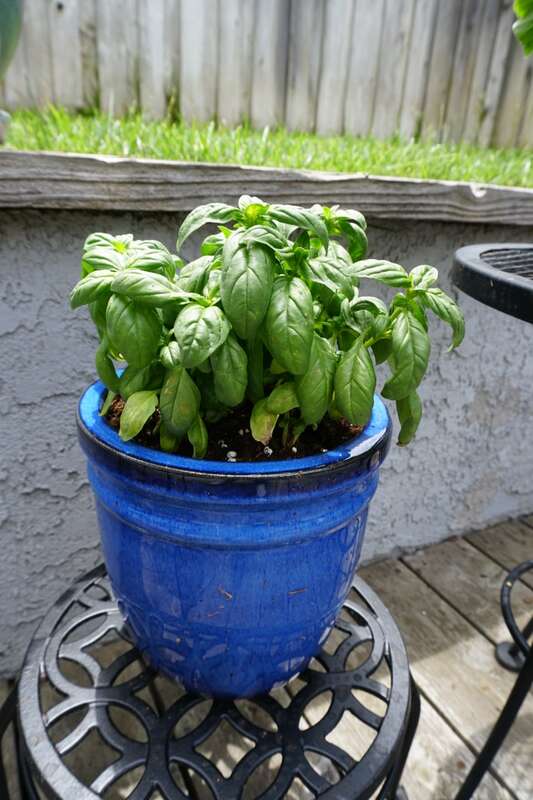 I planted basil in a bright blue pot and mint in a simple gray container. I love basil and mint, and hope to add a good deal of Italian Parsley this weekend! Fresh Basil in a smashing bright blue pot. 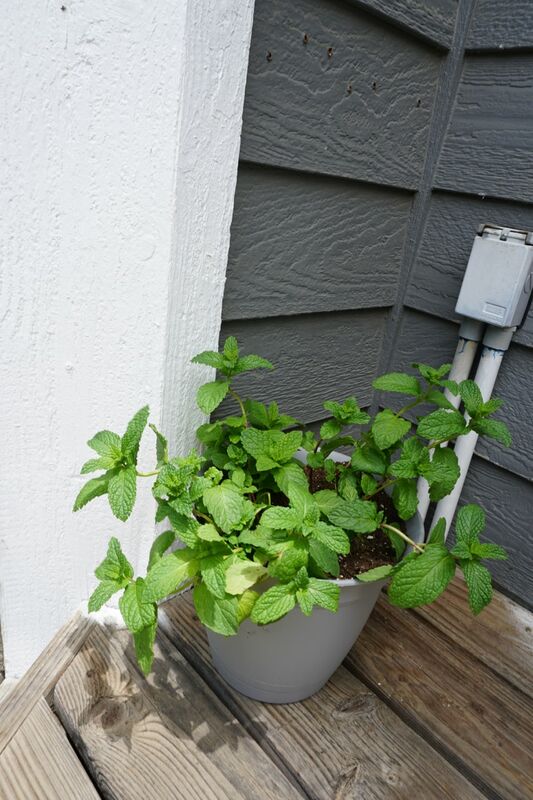 A fresh pot of mint for picking. Love a bit of mint in an Iced tea or chopped and added to a fresh salad. I hope you have enjoyed visiting out Southern California patio. We are loving our hot pinks and the table top Smore maker! Please visit my fellow design blogging pals who are truly awesome design bloggers and always share the most inspirational but doable ideas for your outdoor and indoor spaces! Ohhhh, I love all your flowers and your new pillows!! Your space looks amazing…and hey, I need a smore please 🙂 Great tips for choosing flowers too! You certainly have a great thumb you plants are gorgeous!!!! I love the pink and blue combination and the table top smore’s are perfect fro a evening outside. 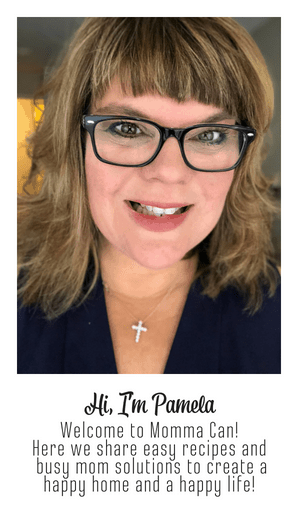 Great post Pam!!!! Your yard is gorgeous! I’m loving hot pink flowers this year too. I had to make myself buy some other colors as well. 😉 Our yard is always a work in progress too. It will look different by the end of this weekend. Oh my how beautiful. You are so creative. Love the flowers and patio. Appreciate you loving Lowe’s as my Hubby is an employee! mmm. s’mores!! I didn’t know that! I might have a couple of questions for him! Pam your plants are beautiful!! I picked up one of those hot pink geraniums I couldn’t resist them either and I love the addition of the herbs too! My daughter and I would love a garden but we don’t have anywhere to put one, this would be a great alternative for at least a few herbs and maybe a tomato plant. Thanks for sharing!! Pam! I love all of the bright colors that you used! It looks like such a fun and cheerful place, yet still a great place to just relax as well! Great job!